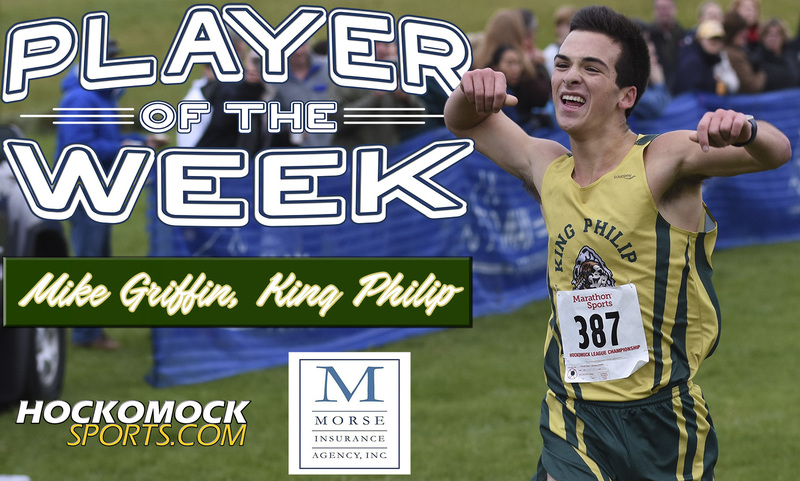 King Philip junior Mike Griffin has been selected as the HockomockSports.com Player of the Week, presented by Morse Insurance, for Oct. 28 through Nov. 3. Griffin is the ninth player chosen as Player of the Week for the 2018-19 school year. Griffin put in a stellar performance at the annual Hockomock Cross-Country Championship at a rain-soaked Wrentham Development Center last Sunday morning. Griffin won the boys’ title in a time of 15:54.67, narrowly beating second-place Tyler Brogan by just one second with a strong kick down the final straightaway. With Griffin leading the way, KP finished third overall as a team. Griffin has had a strong three years on varsity for KP cross-country and track. His performance at this year’s league meet was 13 seconds faster than his time from last year, when he finished third, despite the course recovering from the previous day’s heavy rains and what the runners described as a slow opening mile. Griffin showed his strength in the closing stretch, as he stayed ahead of Brogan in the race to the finish line.